Welcome to Surface Sessions number 8 and what must be the most requested session to date – Ableton Live. It’s one of the most obvious pairings but it’s taken me a bit of time to get here because there were a few other key bits of software to sort out and I wanted to have found all the quirks and issues before I got to this point. In the last Surface Session there was a great deal about using Ableton Live in a live situation so if you’re particularly interested in that side of things then I’d recommend you check out those videos. 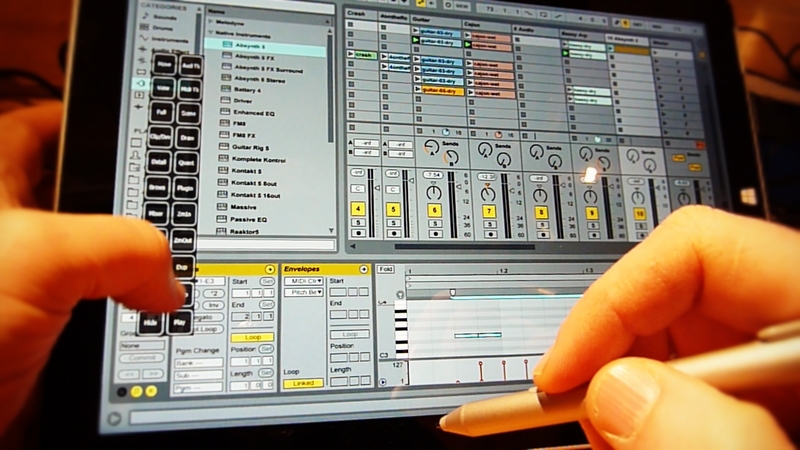 But how well does Ableton Live run on the Surface Pro 3? What issues do we run into? What’s the performance like? Let’s have a look. Installation couldn’t be simpler really – it’s one big download and then run the installer file. It does this annoying thing where it appears to be installed and then spends an hour sorting out the included library and samples. There’s no dongle or anything for copy protection, just a quick connection to the Ableton servers and it’s authorised and ready to go. I’ve never had a problem running my one license on a couple of machines – in this case my main desktop and the Surface – I’m sure there’s a limit to this but my understanding is that Ableton have a sensible approach to copy protection and as long as you’re not taking the piss then they are happy for you to authorise it a couple of times on different machines. Ableton Live is quite happy using the onboard sound, where as usual you have to actively switch between headphones and speakers. This is not without its issues. Ableton sees them both as “Speaker” outputs and can throw an error when you try to change between them – although weirdly after you close the error window the switch from speakers to headphones appears to be successful. It is pretty far from being smooth is any way shape or form and if you’re using the onboard sound then, as usual, I recommend using ASIO4All (.com) to accomplish this. But as with most music software it’s always better to use an audio interface with ASIO drivers. Ableton Live does look very finger friendly but there’s an immediate problem if you try using your finger or a pen. You get this weird zipping around of controls from minimum to maximum, like you can’t quite get it to stop on an inbetween value. With the trackpad it’s completely fine so what gives? I have no idea why it works like this by default but Ableton have a fix for this. What you to do is create an options.txt file to tell Live not to be so silly. You put the file in the preferences folder which on Windows 8 is in “Users – your name – AppData – Roaming – Ableton – Live 9 – Preferences”. You’ll have to turn on viewing hidden files and file extensions. You then have to add the line “-AbsoluteMouseMode” and save it. Now it will work properly. Apparently doing this may affect some other controls when fine tuning using the CTRL key, but I don’t see any other way of making Live usable on the Surface Pro 3. Live has no problems dealing with the scaled nature of the Surface’s desktop and for composition the layout and size of things is pretty great. You can get a lot on screen, access all of the programs bits and pieces without it feeling too small or crowded. However, when it comes to performing, those clip and scene play buttons are just too small to hit reliably with a finger. Two easy solutions spring to my mind – first of all Ableton could install a button or option that simple doubles the height of the clips, making the little play buttons easier to finger and also makes what’s playing easier to see. Another option would be a mode where to entire clip rectangle triggers the loop rather than the tiny play button – that would be genius. Ableton does have something else up its sleeve – it has its own ability to scale. Hidden away in the preferences under Look/Feel is a scaling slider that lets you blow up the interface to alarming levels. At about 150% you end up with the clips and scenes pretty much filling the screen at a size that’s easy to see and easy to touch. The only problem being that you cannot access the parts of the program you can’t see. There’s no scrollbar or way I can find of moving the interface around. It’s a little bit odd to be honest, but also potentially very effective if you don’t mind seeing only part of the screen. Let’s see if the Windows scaling can add anything to this. Whopping the desktop scaling up to a full 200% has pretty much the same effect as scaling within Ableton but you get to see all of the screen. The text gets a bit crappy at this sort of scale but actually, the working screen in terms of size if you were wanting to trigger loops and scenes live is pretty good. It’s annoying that you have to log out and back in to change the scaling like this – not sure why it can’t be a bit more seamless but it does make you feel more confident that you’ll be able to hit those play buttons with your finger – still like the whole clip to be the trigger though! Other touch gestures are completely ignored – there’s no pinch-zoom anywhere as far as I can tell. Running Ableton on the Surface would not be complete without my trusty toolbar constructed in Toolbar Creator. Although I don’t tend to use many keyboard shortcuts in Ableton I was soon able to create something that as immediately helpful if you were using the Surface without the keyboard. See previous post about the pen toolbar for more information on all that or watch the video for more detail. Working with controllers is a bit of thing for Live and I would always use it with the Launchpad as it makes your whole world so much easier. It can be restrictive in its 8 x 8 form factor but as long as you know your projects and set it up to give you the best visual clues as possible then it’s an awesome way of performing with Live. With the scaling adjustments you could do away with the Launchpad but honestly there’s no harm in having everything. Which brings me nicely to the bit of trouble I had with the Launchpad and the Bass Station II that I was trying to run in Surface Sessions 07. It’s time to revisit that to see if I can’t get these two bits of hardware from Novation playing nicely. Well that was easy while running on the onboard audio – no problem running them together through the powered hub and also no problem through the dock. I just added the Avid FastTrack back into the mix and when I selected it in Ableton I got my first ever genuine blue screen. After the reboot I tried again and this time it took it ok with everything working. So just be aware that hardware can let you down and sometimes you need to be patient and try things in different orders if you run into trouble – but it’s totally capable. As ever this is a tricky thing in trying to find some kind of useful comparison. In the videos about my live performance preparation in Surface Sessions 07 you’ll see me run a few projects quite happily with multiple tracks and several Native Instrument plug-ins – check those out for more information. I did find a performance test on the Ableton forum for Live 9 which I’ll have a go of now. Running the 8 track test with the FastTrack at 512 samples I get a CPU peak at 26%. Looking through the thread there’s a MacBook Pro i5 running 30%, an iMac Core 2 Duo running 36%, a 2.9GHz i7 MacBook Pro running 25%. My i7 3770K desktop machine ran it at 13% – what does this mean? To me it means the test is pretty flawed. It’s really hard to do a comparison based on what a CPU meter is telling you because then tend to be rubbish and terribly inaccurate. Using some sort of positive failure test is much more telling. Duplicating the 8 test tracks I was able to get up to 52 tracks before I got crackling. From around 48 tracks I got an initial crackle which then immediately settled down for stable playback. Looking through the thread there’s an i7 2.2GHz Toshiba laptop doing about the same, a MacBook Pro i7 2.6GHz doing around 80. My desktop machine went over 100 without any trouble. So do you see what I mean about measuring performance being a tad problematic. It will also vary depending on the audio interface you’re using as some drivers are more efficient than others. Suffice to say that the Surface has performed well, with multiple tracks, a handful of large instruments and appears to compare well to other portable computers of similar specs. Does that help at all? So Ableton Live and the Surface Pro 3 is a match made somewhere on its way to heaven. There’s a few key things that Ableton could do in order to make it a more joyful touching experience but with my handy toolbar the editing is a breeze with the pen and when you scale it up you have a totally workable performance tool. I wish one of these big players had the imagination to embrace touch technology on the desktop – it would be an awesome thing. It’s time to start looking at software that does have touchableness built in, so coming up next is Sonar, FL Studio and Stagelight and lets see how at home they feel on the Surface Pro 3. I played my first gig with it the other day however, using the surface editor program i mentioned in a comment on ep 6 (I believe), which, by the way, automatically has the entire surface area of clips and scenes treated as buttons, so that kills multiple birds. All in all, it worked out fantastically. My only real issue is buffer size: I’m having to set mine to 512, using asio with an m-audio mtrack in order for my setup (so far 15 software instruments with effects, patched 3 at a time) not to crackle, and that’s just out of comfortable range for performance. I have the 128 i5 with 4 gigs of ram. Thanks for posting these, you are a singular and great source for those of us brave enough to use the surface in this way. I would recommend freezing instrument tracks to audio if you’re playing live – you want to give yourself as much headroom as possible and low latency. Loading and triggering actual instruments adds too much risk unless you need to play them from a keyboard as part of the performance. What is the “surface editor” you speak of? I can’t find an earlier comment. Cool – i’ll look into that. lblb is always improving it and it didn’t have that functionality last time we spoke. Hey, dont use the windows scalling.. All looks pretty crappy.. Go to the EXE proprieties and disable windows scalling, then scale to whatever(200% on my tablet, not a surface, it’s an onda v975w) in Ableton live settings, and everything will look perfect! Btw, thanks for the touch fix, now it’s perfect. Ableton live 9 is really good optimized, runs great on my tablet with atom quad core z3735d, mindblowing!! BUT: it’s full featured, it’s touch optimized for Windows 8, it deals with the Surface’s high DPI display and its very streamlined. There seems to be some clever engineering behind it so maybe it’s worth a review. Thanks for this series, it’s always a very good read and has been very helpful. I’ve spent some time with MultiTrackStudio when I was writing an article on multi-touch for Sound On Sound magazine, but it’s not really all it claims to be. There isn’t really any “multi” touch going on, it’s all single touch and although Giel has made some touch friendly design decisions I struggled to have a good time with it. I may revisit it if I can find the time. Cheers. thanks for your reply. I just checked and I can zoom in and out inside wave and midi editors with multitouch pinch gestures. Maybe it’s a feature which wasn’t present at the time you were reviewing MTS. I’ve always been a Cubase guy but I really got frustrated when trying it on the SP3, mainly because of the GUI. Using it without a pen was nearly impossible. As the Surface is lying on top of a Synthesizer in live situations, I didn’t want to use the pen on a crowded GUI. Sonar X3 felt much better. I came across MultitrackStudio searching for a discussion of DAWs and their problems with high dpi displays. One guy mentioned MTS and its easy accessibility. The GUI works pretty good (I’m on the limited free version right now) and now I have to find out if there’s a big price to pay in terms of missing features. Yes you’re right, it does do some gesture stuff but most non-touch DAWs do that as well. I guess i’m after the ability to move two faders or two controls (classically resonance and cutoff) at the same time. So how are you using the Surface live? What are you trying to control or move or edit mid-gig? My old iPad having died on me, I’ve just purchased a SP3 with the objective of performing live with my band. I play a Yamaha S80 as master, a Roland XP10 for brass and lead. I wanted the SP3 as an expander and for launching sequences and samples during the play. Of course from one boot to another, the output changes (not reassuring) and I feel uncomfortable using it on stage. Simple – get an audio interface. You’re right about the unreliability of the on-board audio outputs – when I spoke to the Surface development team they believed that having two independent drivers was an awesome idea – it really isn’t. Get yourself a Steinberg UR box or a Native Instrument Komplete Audio 6 – spend 100 quid and get yourself reliably low latency, high quality audio in and out. As I’m a live keyboard player most of the time my workflow always had been: create all backing tracks in Cubase – mostly MIDI, as I’m using a lot of external synths and rarely VSTis – export the track to a Standard Midi File and import that into a Kurzweil Workstation, which is my main live controller. b) making the export and import of those tracks obsolete as I could simply place the Surface on top of my synths and use it as the main machine for backing- and clicktracks. c) could be an added bonus as I’m willing to replace my super-reliant but heavy Akai S6000 with an software sampler. It’s mainly one-shot samples so this should be no problem. d) It would be very cool to have lyrics displayed on the Surface so I don’t have to look for yet another solution. Sonar seems to have a decent lyrics-view feature but I haven’t had the time to check it out yet. So this is my current requirement: a new DAW to record and playback tracks with a good GUI for touch and live use. Cubase is definitely out of the race due to their way of “protecting” the software. No dongles for me anymore. And this is why I came to MultitrackStudio, it just seemed tidy and focussed. I’m open for anything, Sonar seemed quite nice on the Surface and I heard good things about Studio One. I didn’t have much fun with some other DAWs I checked out, mainly due to their GUIs (tiny knobs, only usable with the pen etc,). It just wasn’t fun using them on the Surface’s screen. It’s a completely different story on my desktop DAW with two 24″ displays, but this is not an option currently. I would be very happy if you could provide some input and suggestions. Btw: I just purchased your SOS article about touch screens and it was a very good read. Sounds to me like you know what you’re doing. The value of any piece of software is in it’s usefulness to you, in your situation and it looks like Multitrackstudio fits the bill. Something else i’d look at is Stagelight from Open labs – http://us.openlabs.com/ – it has more power than it seems and I mean to get into some depth with it once I’ve got my Cubase 8 review out the way. It supports VST instruments and has a great touch interface and it’s $10. The only other thing you need to consider is the audio interface – something that gives you reliable low latency and doesn’t give you cabling nightmares. Thanks Robin. I’ll check out Stagelight once again. I already had a demo installed not long ago but it just seemed too limited, especially in respect to MIDI. But maybe there’s more than just a nice GUI. Hey, I wonder whether next time you could also quickly look at latency, and more particularly the difference between the dock and the on-board USB when plugging in your interface. I’m still in the process of deciding what interface to buy and whether to get a dock or not for my studio setup. I already have the dock for my regular working environment and noticed that using the dock’s audio out requires much higher buffersizes (around 4000 bit) than with the onboard headphones out (around 200 bit) to get glitch-less playback. This might be caused by the different audio processor in the dock vs on-board, but it could actually also be due to the fact that all I/O (incl. display, all other USB…) with the dock goes through that one single charger port. If that’s the case, then it is not unlikely that with an external audio interface, the latency will be much worse when plugging it into the dock vs plugging it into the single on-board USB. Of course, it might also be (or even likely) that that charger port has separate connectors for network, USB and display in which case it probably won’t make much of a difference. Still would be interesting to see some test results as far as latency is concerned. Looking forward to your Sonar video. I’ve used audio Interfaces in the usb socket, the dock, a powered and unpowered hub and not noticed any difference – but I’ve also not been looking for one. I’ll keep an ear out. 1) In Ableton 9 in Windows 10 on my Surface it will not recognize any “right-click” actions from the stylus or touch. It does fine with a mouse or trackpad. Have you or any of your readers encountered this? After some substantial web searching and troubleshooting I’m kind of hitting a brick wall on what to try next. 2) I’d love to find a nice on-screen piano that will trigger MIDI notes in Ableton or other DAWs. Even if it is single touch, it would be a god-send. Has anyone figured a good solution for this? Mine neither – I hadn’t noticed this before and now of course I can’t remember if it worked in Windows 8 although I can tap-and-hold right-click fine on my Windows 8 desktop touch screen. That’s an unusual one but makes me think that Ableton will have to do something to cope with that – but i’ll put it out there and see if anyone has any ideas. Most DAWs have their own piano rolls or pianos that are part of a VSTi gui but they don’t always play well with touch. Now that MIDI is supported in modern apps you might find something in the Windows store that would do the job – but im not that hopeful. You could try to see if StageLight from Open Labs will let you route MIDI out from their excellent multi-touch piano interface – maybe a virtual MIDI driver would do it. Let me know if that works for you, and what the latency is like. Hey! Thank you for all your reviews and videos. I love everything about Ableton Live, except for two things: 1) while it could be a perfect marriage with the Surface, it isn’t. And 2) they don’t seem to have interest on that, no matter how you ask. About right-clicking in Live, I happen to have two Surface Pros v.1 (no, I’m not rich – short story, one of them got hardware issues so I somehow ended up with two of them). One of them was updated to Windows 10 and the other one (the good one) still with Windows 8.1, which I think it’s far better and snappier than 10. I can confirm that right clicking is impossible in Ableton 9.5, either by touch or pen Press-and-hold, or by using the barrel button. However, there’s a driver from Wacom – the Feel Driver – that ‘unlocks’ a couple of nice pen features and offers better calibration. The pen barrel button DOES work with Ableton and this driver. Unfortunately that’s for Wacom enabled Surface Pro’s (SP1 or SP2). I think the SP3 doesn’t use a Wacom pen. It would be nice if ntrig released such a driver. Other than that, I think you are stuck with a third-party dock tool, such as Tablet Pro from the Windows Store. That’s very interesting, thanks for the tip. I’ve found that the right-click with the pen can work if you drag the pen at the same time – I have idea why. I’ll get onto it on the SP4 pretty soon. I struggled with the AbsoluteMouseMode for a whole night and part of a morning, today 12th of april. Didnt realize that i was doing the Options.txt.txt thing!